A proposed development located at 33 West Cordova is awaiting final approval from the city. 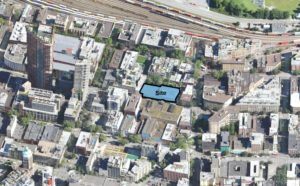 The 19,071 square foot site located in the Gastown area backs onto Blood Alley. The site was previously used as homeless shelters operated by a non profit organization. Location for 33 West Cordova a proposed condo development. The proposed development by Westbank will consist of 11 storeys and 214 rental apartments (80 social housing units/134 secured market rental units). There will be commercial space on the ground floor. Commercial space will include a wine bar. The development will also create new southern frontages for 33 West Cordova. The project will also provide 267 bicycle parking spots. No changes are currently proposed for Blood Alley. However the city is planning their own separate designs for the redevelopment of the alley. The project is still awaiting final approval as the land is currently zoned as HA-2. Update- This development has been rejected by the city and will not go ahead as planned.